Gilberte Interiors, Inc. Delivering on the Details - Gilberte Interiors, Inc. The Taylor house in Lyme, New Hampshire, was a project that we came to after much work had already been done. The family was building an addition that included a new bathroom, and they already had a cabinet maker and basic cabinet design. What they needed was someone who could see the greater picture and help figure out how all the pieces would best fit together. For this project, the aesthetic was incredibly important to the client. What is the best path forward to an integrated combination of beauty and functionality? Details. 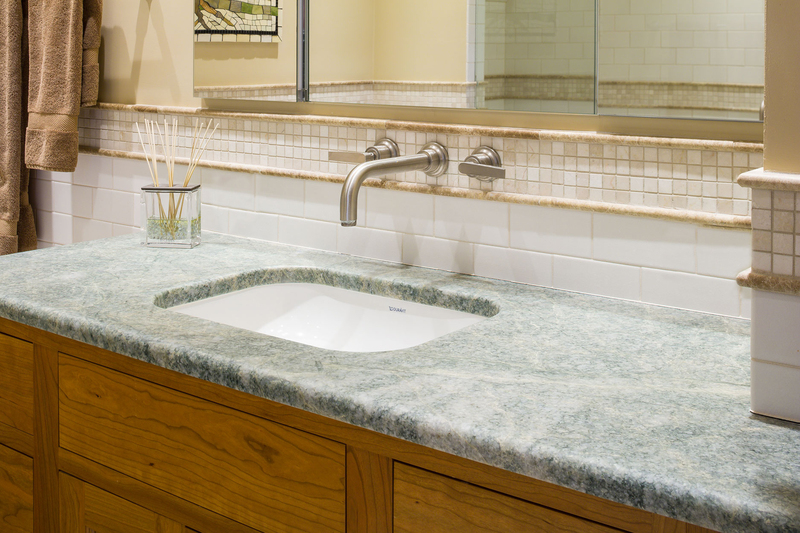 For example, while you might not realize this upon entering the bathroom, the stone mosaic that lines the wall around the entire room is centered on the wall faucets above the green stone counter. 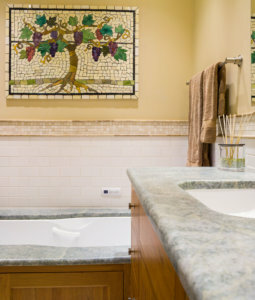 And the entire color palate, from the subway wainscoting to the green stone that plays a role in every corner and applies consistency to all horizontal planes, is derived from the grapevine mural hanging on the wall above the tub. The aforementioned wall faucets make cleaning the counter a breeze, as does the wall-mounted toilet that sits in its own private cell next to the shower. 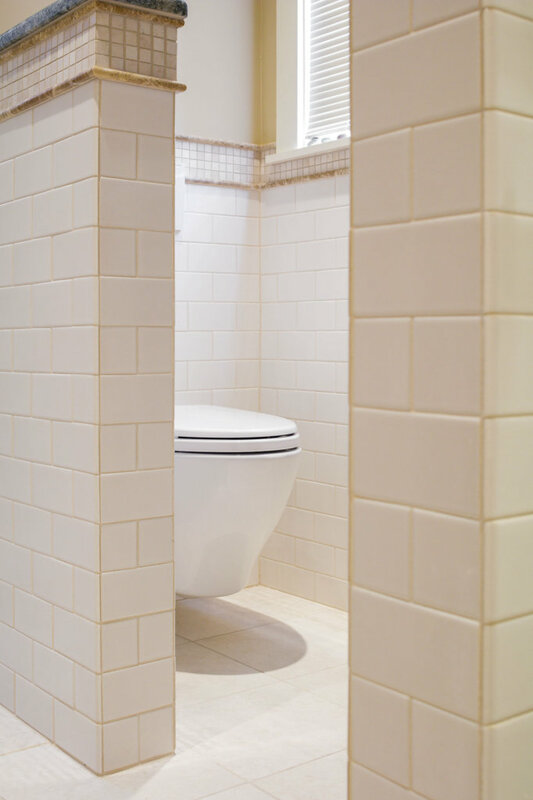 A wall-mounted toilet offers other benefits as well, such as the streamlined appearance (only the bowl is visible) and the saving of space—the bowl only projects out about 21 inches as opposed to the 31 inches taken up by a regular toilet and tank. Every bathroom needs some storage, and that was created in two cabinets cut into the wall above the sink. The mirrored fronts of these cabinets play dual parts when opened and used in conjunction with the middle mirror—anyone trying to see the back of their head will be thrilled with such a clear view! 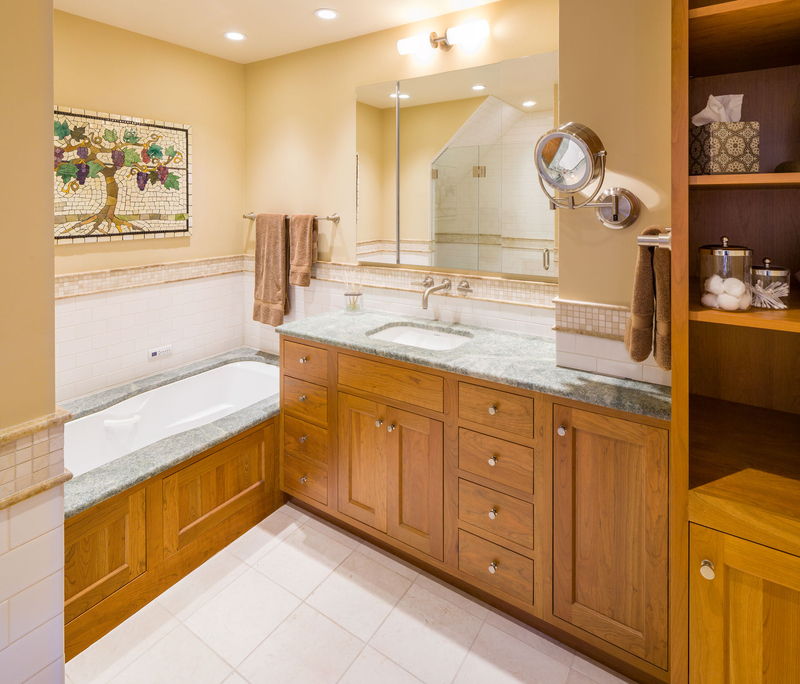 In this bathroom, the warm blend of traditional and modern design plays itself into a space that combines beauty, functionality, and serenity. Of course, every project has its moment of panic, and for this bathroom, that moment came when the green stone that was supposed to frame the bathtub was installed. Or, rather, was supposed to be installed. Even after incredibly meticulous measuring, the stone was cut wrong, leaving a gap between the tub and the stone when the stone was supposed to extend to the tub’s edge. A simple reporting error, but one that could have derailed a week’s worth of work. Not on our watch. I coordinated with the stone mason and made the drive to the stone yard to ensure that the error was fixed and the new stone slab perfectly matched the original. Mistakes are bound to happen on any job site—it’s how contractors deal with mistakes that mark them as professionals you look forward to doing business with. The end result is a bathroom the client is thrilled about—a space that allows for ease of use and a moment or two of serene beauty during a busy day.